here's some Helpful Links to comedy scenes all over the world! Your generous contribution will go towards maintaining this website, so I can keep adding helpful links in the middle of the night and make sure everything is up to date. See you on the comedy battlefield! Gulf Coast Comedy Roundtable: A Facebook group focused on comedy in FL, AL, MS, and LA. Indiana, Kentucky and Ohio Comedians: A Facebook group focused on comedy in IN, KY, and OH. Midwest Comedy Connection: A Facebook group focused on comedy in the Midwest. Northwest Comedians (Booking / Networking): A Facebook group focused on comedy in . Comedians With Cars Getting Gigs(Tri-State): Facebook groups focused on comedy in NY, NJ, & PA.
Huntsville Comedy: Facebook page to keep up with the "independent" Huntsville comedy scene. Huntsville Comedians: Facebook page to discuss comedy with fellow Huntsville comics. AK Comics: Facebook page is Alaska's comedy headquarters. Show and mic listings for Anchorage. Bird City Comedy Festival: Awesome list of showcases, open mics and storytelling mics for Phoenix, Mesa, Tucson, Scottsdale and Flagstaff. One stop shopping here. Arkansas Comedy Scene A Facebook page listing all the upcoming comedy events. Alan Henderson Comedy Open mics and shows in San Diego- updated weekly. Hey I'm Coming to Denver! Helpful Facebook page to research your trip! 970 Comedy: A Facebook page covering shows and open mics in Fort Collins. Fort Comedy: Another Facebook page for Fort Collins Comedy. Colorado Comedy Open Mic Events: Another helpful Facebook page. CT Comics Fun: Facebook page promoting shows, open mics and joke-writing. Southbound Comedy: A Facebook page with some shows and open mics. Brevard Comedy: A Facebook group focused on comedy in Brevard County. Central Florida Comedians: A Facebook group focused on comedy in Central Florida. Jacksonville Comedy: A Facebook group focused on comedy in Jacksonville. The Orlando Comedy Scene: A Facebook group focused on comedy in Orlando. Tampa Bay Comedy: A Facebook group focused on comedy in Tampa/St Pete. Georgia Comedy Scene: A Facebook group focused on comedy in Georgia. Athens, GA Comedy, Athens Ga Comedy: Facebook groups focused on comedy in Athens. Atlanta Comedy: A Facebook group focused on comedy in Atlanta. Local Savannah Comics: A Facebook group focused on comedy in Savannah. Atlanta, GA Comedy Open mics, clubs, and showcases. Power Up Comedy a group of comedians and entertainers, that have joined forces to create a power house of comedy on the island of Maui. Honolulu Stand up Comedy A Facebook group focusing on comedy on the island of Oahu. Boise Comedy: Facebook page focused on Boise Comedy. Idaho Comedians: A Facebook page to keep tabs on the tiny comedy scene. ComedyofChicago.com: A complete open mic list for all of Chicagoland. Chicago Comedy Gig Booking Group, Chicago's South Side Legends of Comedy, Chitown Comedy, Chicago Comedy Scene: Facebook groups focused on comedy in Chicago. Comedy of Chicago: A Facebook page for Chicago city proper. Chicago Suburbs Comedy Scene: A Facebook group for suburban Chicagoland. Evansville Comedy Scene: A Facebook group focused on comedy in Evansville. Fort Wayne Comedy Scene: A Facebook group focused on comedy in Ft Wayne. Indianapolis Comedians Group: A Facebook page to find/book venues, share ideas, post shows, etc. The Des Moines Comedy Scene: Facebook page promoting shows- open mics and showcases in the right hand column! Dubuque Comedy Page: A Facebook page for shows and open mics in Dubuque! Iowa Comedians: A Facebook group where Iowa comedians discuss shows, mics, etc. Iowa Comedy: Facebook group for everything Iowa comedy! Kansas City Comedy Fans: Facebook page promoting shows and mics. Wichita Comedy: A calendar of upcoming shows and mics. Wichita Comedy FB: Facebook page connecting you to everything comedy-related in Wichita! 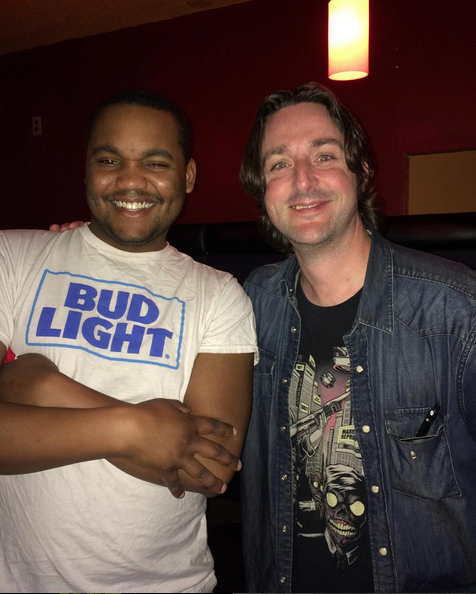 Louisville Area Comedians, Louisville Comedy, Louisville Professional Comedians: Facebook groups focused on comedy in Louisville. Louisville Magazine: Page of open mics and other current events going on. Baton Rouge Comedy: A Facebook page promoting shows and open mics. Lafayette Comedy: Facebook page for shows and open mics in Lafayette! New Orleans Comedy: Website for New Orleans comedy. Show listings and you can message them an SOS if you're coming into town. Comedy in Maine A Facebook Page listing shows and mics. The Baltimore Comedy Collective: A Facebook Group to post shows, opens mics, and comedy crap. DC Standup.com List of open mics, producers and venues-everything you need! Northampton Comedy Scene: A Facebook group focused on comedy in Northampton. Michigan Comics Network (MCN): A Facebook group focused on comedy in Michigan. Detroit Comedians and Comedy Fans: A Facebook group focused on comedy in Detroit. Twin Cities Open Mics: A list of all open mics in the Minneapolis/St. Paul area. Jackson Mississippi Comedy: Facebook page promoting shows and all things comedy. Mississippi Comedy: Facebook page promoting shows and festivals. St. Louis Comedy Open Mic List: Great list of open mics, standup and storytelling shows. KC Comedy: A Facebook group focused on comedy in Kansas City. Comedians of Springfield (MO): A Facebook group focused on comedy in Springfield. STL Comedians: Facebook groups focused on comedy in St. Louis. St Louis Area Comics: A Facebook group focused on comedy in . Missoula's Homegrown Stand up Comedy! A Facebook group for comedians in Missoula. Montana Comedians: A Facebook group focused on comedy in Montana. Omaha Comedy Scene: Facebook group for booking and promoting stand up, improv, and sketch in Omaha, Nebraska. Las Vegas Stand-up Comedy, Las Vegas Comedians: Facebook groups focused on comedy in Las Vegas. Reno Area Comedians: A Facebook group focused on comedy in Reno. NH Comedian Connection: A Facebook group focused on comedy in New Hampshire. NJ comics & comedy venues & promoters: A Facebook group focused on comedy in New Jersey. Hudson County Comedy: A Facebook group focused on comedy in Jersey City. South Jersey Comedy: A Facebook group focused on comedy in South Jersey. Albuequerque Comedy: Great updated list of open mics. New York City Open Mics: A list of all open mics in NYC. Albany (NY) Area Comedians: A Facebook group focused on comedy in Albany. Hudson Valley NY Comedians: A Facebook group focused on comedy in the Hudson Valley. Ithaca (NY) Area Comedians: A Facebook group focused on comedy in Ithaca. NYC Improv/Standup/Sketch Resource, New York City Comedy, Stand Up Comedians Metro NY, New York Comedians, NYC Comedy Bookings, Queens NY Comedy: Facebook groups focused on comedy in NYC. Rochester Comedy: A Facebook group focused on comedy in Rochester. Syracuse Comedy: A Facebook page foocused on Syracuse, NY. North Carolina Comedy: A Facebook group focused on comedy in North Carolina. Asheville Comedy: A Facebook group focused on comedy in Asheville. Charlotte Comedy Scene: A Facebook group focused on comedy in Charlotte. Gtown Comics: A Facebook group focused on comedy in Gastonia. Greensboro Comedy: A Facebook group focused on comedy in Greensboro. Triangle Comedy: A Facebook group focused on comedy in the NC Triangle. Fargo Local Comedy: Facebook page focused on open mics and shows. Cincinnati Stand-Up: A Facebook group focused on comedy in Cincinnati. Cincinnati Comedians, Cincinnati - Northern Kentucky Comedy/Comics: Facebook groups focused on comedy in Cincinnati. Cleveland mic calendar: A google calendar with many cleveland open mics on it. The Comedy Corner: Oklahoma City Facebook group to post comedy discussion, upcoming shows, etc. Tulsa Comedy Collective: A Facebook group to connect, share shows and open mics. Eugene, Oregon Comedy Scene: A Facebook group focused on comedy in Eugene, Oregon. Portland, Oregon - Open mic list: Open Mic list site that is more or less up to date and active. WitOut: Comedy blog includes open mics in Philly and show calendar. Philly Comedy Network: A Facebook group focused on comedy in Philadelphia. Pittsburgh Stand-Up Open Mics: Pittsburgh, PA's stand up open mic scene! Rhode Island Comedy Open Mics: A Facebook group to post all your open mics. Greenville Comedy: A Facebook group focused on comedy in Greenville. Charleston Comedy: A Facebook group to post about showcases and comedy related events. An open mic list is in the right column. Sioux Falls Comedy Club: This Facebook page also highlights open mics, shows, and sketch comedy in the surrounding areas. Memphis Comedy: Facebook group focused on Memphis comedy. Last Gas Comedy: All your Austin comedy info here! Mics, shows, sketch, improv, etc. Texas Comics, Texas Comedians: Facebook groups focused on comedy in Texas. ATX Stand Up Comedy, Austin Comics, Austin Open-Mic Comedy: Facebook groups focused on comedy in Austin. DFW Comedians: A Facebook group focused on comedy in Dallas/Ft Worth. Houston Comedy Stage Time: A Facebook group focused on comedy in Houston. SLC Comedy Scene: A Facebook Page for the Salt Lake City comedy scene. The Utah Stand-up Network: A Facebook group focused on comedy in Utah. Vermont Comedy: A Facebook group. ComedyRVA.com: A list of all open mics in Richmond. Comedians of West Virginia Facebook group. Seattle, WA Really great listing of Seattle and the East side open mics/shows. Seattle Comedy Shows and Open Mics: A Facebook page for all your comedy needs in Seattle. Spokane Comedy: A Facebook group for comedians in Spokane. SpoCom: Another Facebook page for Comedians in Spokane- shows and open mic listings. Charleston Comedy: A Facebook page to post about showcases or comedy related events. Open Mic Schedule: Calendar of open mics in Charleston. Milwaukee Comedy: Great updated list of open mics and events. Wisconsin Stand-Up Comedians: A Facebook group focused on comedy in Wisconsin. Wyoming Comedians: A Facebook group for Wyoming Comedians. Wyoming Comedy: A Facebook group for Wyoming comedians to commune. Comedy Uncovered: Toronto's Online Comedy Resource with open mics and shows. Thunder Bay Comedy: A Facebook group focused on comedy in Thunder Bay. Toronto Stand-Up Community: A Facebook group focused on comedy in Toronto. Comedians of Montreal: A Facebook group focused on comedy in Montreal. Wozzon Comedy Store: A Facebook group focused on comedy at the Wozzon location of the Comedy Store in London. Facebook Comedy Forum: A Facebook group focused on comedy in the UK. Mad4Madrid: Article covering open mics in Madrid, Spain. Includes mixed mics. Noobs of Hki. Listing of open mics in Finland. South African Stand-up Comedy: A Facebook group focused on comedy in South Africa. Comedians in Asia. Closed FB group for news, events and discussions around Standup in Asia. Hong Kong - TakeOut Comedy. Asia's longest running full time Comedy Club. Based in Hong Kong with shows in Shenzhen and Guangzhou. Philippines - Comedy Manila. Standup group based around the Manila area (and sometimes Cebu) in Philippines. Malaysia - Crackhouse Comedy. Comedy group based around Kuala Lumpur. Thailand - The Comedy Club Bangkok. Comedy group based in Bangkok. South Korea - StandUp Seoul. Comedy group based in Seoul but do shows all around South Korea. Japan - Comedy Fukuoka. Comedy group based in Fukuoka, but does shows around Japan. Japan - Raugh Out Roud Comedy. Comedy group based in Osaka, but does shows around Japan (mainly Okinawa). Comedy Rooms Around Australia- awesome list of venues hosting comedy and information about the Melbourne Comedy Festival. Comedy Rooms of Australia- Facebook group to help comedians find gigs. Rockhampton - Allsorts Facebook group for Rockhampton's open mic - it's a mixed mic, but run by comics and has a very strong comedy presence. Here are the open mics I reviewed outside of California! I wish I could keep track of all of them, but at the very least you can read about my experiences. I have no idea if they're still running, so you're going to have to do some research! Herberger Theater Center (KAX Theater) 222 E Monroe St.
House of Comedy 5350 E High St.
Devil's Advocate 955 E. University Dr. SAT Renegade Brewing Company 925 West 9th Ave.
THURS Motor City Cafe 4080 Paradise Rd. MON Tony V's Garage 1716 Hewitt Ave. Sign up 7:30pm. 4-10 minutes. MON Blue Moon Tavern 712 NE 45th St, Seattle. Sign up 6:30pm 4 minutes.